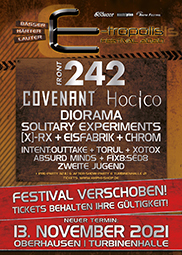 E-tropolis 2019 – Thank you Oberhausen! With the final chords of Apoptygma Berzerk this year‘s E-tropolis Festival gets to an energetic close. And while the aftershow-party keeps the dancefloor steaming until the early morning, it is time to send out a huge THANK YOU to all of you for the great mood and a sold-out house with over 4000 visitors. Don‘t be shy to share your favourite impressions and photos with us on facebook or our new Instagram-profile: @etropolisfest at #etrop19 ! 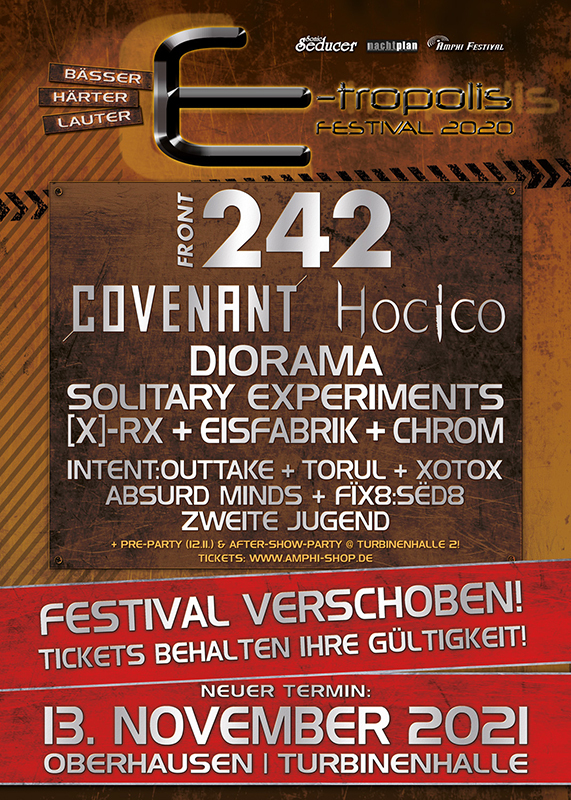 Pre-selling for 2020 starts already tomorrow on Monday, 18.03.19, at www.amphi-shop.de and at all nationwide CTS/Eventim box offices with the first bands COVENANT, DIORAMA, SOLITARY EXPERIMENTS, GRENDEL, EISFABRIK, WINTERKÄLTE, TORUL and RUINED CONFLICT! All the best Your E-tropolis Team!